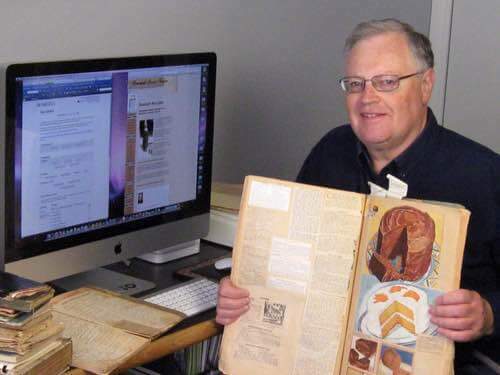 My name is Don Bell, and I decided to add this About Me page because people have asked how I came to build a successful website featuring old fashioned dessert recipes and nostalgia. I love the question because it gives me an opportunity to share how creating this website has truly been a rewarding experience in my life. People are surprised to learn that I built this large site myself and that it actually helps to pay my bills. Occasionally, someone with a collection of family recipes will want to know how to start a recipe site or a food blog of their own, while others are interested in possible site topics besides recipes. Maybe you have a unique hobby, a skill, or an interest that you'd love to share online. So, I wrote a special page that reveals the behind-the-scenes process. It shows you step-by-step how to build a website on almost any topic. I'm always happy to share what I've learned so people can build a site of their own and get to experience the same enjoyment I do. Permit me to share a little of my background with you first. I work out of my modest country home in the beautiful Kawartha Lakes tourist region surrounding Peterborough, Ontario, Canada. It's known as the land of shining waters, and it's an ideal place to live. Our acreage was once part of Bellthorpe, my family's farm, and the fields, stream, and forest that I once roamed as a young boy now provide both recreation and a strong sense of belonging. My wife Vicki and I have been married for over 45 years, and we're blessed with four grown children — two boys and two girls. I suppose they consider us senior citizens now, but we've yet to grasp that concept. Like most people in this world, we've had our share of ups and downs, but God has truly blessed us with a wonderful life together. While planing for an early retirement, I looked for something that I could do to earn additional income from home. After years of self-employment, I haven't the luxury of a company pension plan and family adoption expenses in the mid 1990s depleted all our retirement savings. But, it had to be something not too difficult that I would enjoy doing, something hobby-like. Life is much too short to do otherwise. It also had to be something that would require little or no startup money and involve minimal financial risk. "You can get rich right where you are. At home. Not somewhere else. Not a person has secured great wealth by going away who might have secured as much by some other means if he had stayed at home." Applying Conwell's advice, I searched our home to see what was at hand that could be used to generate some extra income. To my surprise, besides my Mac computer, I discovered a unique collection of my mother's handmade recipe scrapbooks and old fashioned cookbooks. And since I love desserts — far too much according to my wife, all I needed was to find a profitable way to share our family's favorite desserts with people who love to read and collect old fashioned recipes. People ask, "Where did you find all those wonderful old fashioned dessert recipes?" Well, happily for me, I discovered them all sitting on a dusty shelf in a dimly lit corner of our basement. You see, throughout her youth in the 1920s, my mother loved to collect recipe clippings and colorful food illustrations, and she pasted them in scrapbooks. 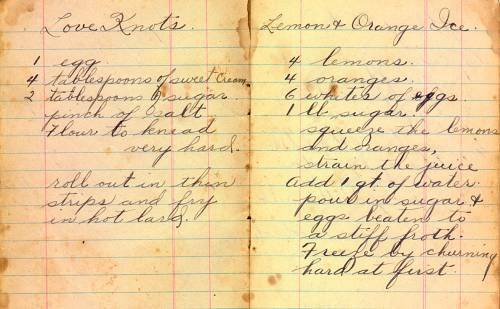 Later on, she inherited several of her mother's handwritten recipe books and some vintage cookbooks that are now in the public domain. I eventually inherited Mom's recipe collection along with a few cookbooks and family recipes used by my Grannie Bell on my father's side of the family. So, thanks to Mom and my grandmothers, I now have lots of wonderful old fashioned dessert recipes to share with other recipe lovers. Mom and my grandmothers were simple, honest women who loved their families and doted on their grandchildren. I was so blessed to know them and to have had their positive influence on my life. They led very full and interesting lives and although circumstances were sometimes difficult for them, they seldom complained. They rose above the hard times and were thankful to God for His strength and provision. 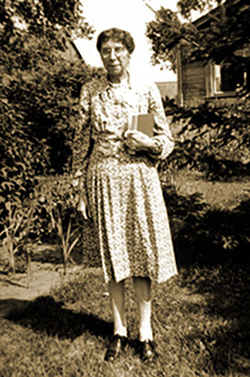 Daisy Adelaide McIlmoyle (1911-1985), was born in Calgary, Alberta in 1911. She and her twin brother Herbert were the youngest of 10 children — 6 girls and 4 boys. Her father was Herbert Leslie McIlmoyle (1872-1936), and her mother was Margaret Annie Adelaide Butler (1878-1951). Originally from Ontario, they took out a homestead near Airdrie in 1901, before moving to Calgary sometime before 1911. The year Mom was born, her family returned to Ontario, and she was raised on the McIlmoyle family farm at Selwyn, near Lakefield. 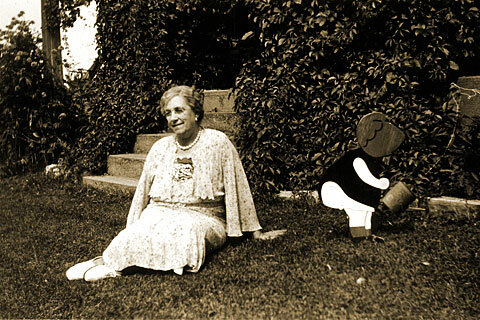 She often remarked how wonderful it was to grow up in a large, loving family where there was seldom an idle moment, and always time for fun. As a young woman starting life, she worked as a cook at a Stony Lake resort, and later as an assembler at the Western Clock Company (formerly the Westclox) in Peterborough, until she married my father, William Robert Bell (1908-1990), in the fall of 1939. It always fascinated me that the McIlmoyles and the Bells lived just 15 miles apart while in Alberta, yet it wasn't until both families moved east to Ontario that Mom and Dad met, while again living just 15 miles apart. My father first met my mother when he and his father visited the McIlmoyle farm to buy a breeding cow. They married in October 1939, after the Great Depression, when both money and work were still scarce. Dad scoured area farms collecting hundreds of used seed bags which he mended and washed then redeemed for 6 cents apiece to earn enough for Mom's wedding ring. She so treasured that gold wedding ring with its tiny diamonds! Mom and Dad farmed Grannie Bell's property in Otonabee Township, which they eventually inherited in 1955. When they had retired from farming in 1965, they sold the farm but retained ownership of a 65-acre parcel of land where they built a new house. I eventually inherited the property and moved there with my family, and remain. While in her late teens, around the time the above portrait had been taken, Mom created two remarkable scrapbooks in which she pasted clippings from the magazines and newspapers of her day. The clippings mostly feature dessert recipes, but there's also party ideas, homemaking advice, and helpful kitchen tips, along with colorful vintage illustrations — a treasure trove of nostalgia. Throughout her marriage, Mom also kept several small notebooks in which she wrote her mother's and grandmother's recipes for homemade desserts. Many were obtained either directly from her mother or indirectly through her sisters after their mother's death. This website owes a huge debt of gratitude to Mom. Many old fashioned dessert recipes featured on this site are carefully transcribed from her handwritten recipe notebooks and scrapbooks. Margaret Annie Adelaide Butler (1878-1951), was born in Shropshire, England. At age nine, Grandma emigrated to Canada with her parents in 1887. She married Herbert Leslie McIlmoyle (1872-1936) in 1899, and having moved to Alberta, they became homesteaders near Airdrie in 1901. Grandma McIlmoyle worked long, hard days as a pioneer rancher's wife. She watered cattle, forked hay, groomed horses, and tended her large vegetable garden. She also kept the house and prepared hearty, delicious meals for her hardworking husband and eight small children. Nothing topped a meal off or brightened an exhausting day like a tasty dessert. Grandma's time was limited, so she chose the proven family recipes she knew would always turn out delicious. Life was often difficult for homesteaders on the lonely prairie. They needed to be strong and resourceful. Once, when Grandpa had been in Airdrie purchasing supplies, the billowing smoke of a grass fire loomed on the horizon. Leaving the older children in charge of the youngest, Grandma quickly harnessed the oxen and ploughed furrows around the house and barn to prevent disaster. Sometime after their eighth child was born, they moved to Calgary where my mother (Daisy) and her twin brother (Herbert) were born in 1911. That same year the family moved back to Ontario, and Grandpa eventually purchased a farm at Selwyn, near the Village of Lakefield. Grandma McIlmoyle died when I was very young, so I have only fleeting memories of her. I cannot recall her cooking or baking, though I must have sampled some of her famous cookies at times. However, my older cousins well remember the taste of Grandma's amazing desserts. Grandma's legacy of cooking skills and proven recipes was lovingly passed down to her daughters, and they continued the tradition of baking homemade cakes, pies, puddings, and other delicious treats for their families. Annie Stewart Gentles (1881-1955), was born in Uphall, Scotland. Her father was Archibald Gentles (1855-1926), originally of Muiravonside, and her mother was Ann Stewart MacDonald (1858-1944), daughter of James MacDonald (1821-1875) of Morayshire, Dyke, Scotland. While in her teen years, Annie and her sister (Margaret Wallace Gentles) attended a commercial business college in Edinburgh, sometime around 1898, during the time when their parents lived in Assam, India. Her father was a chemist and manager at Young's Oil Company and while accompanied by his wife, he had been sent to India for a year to oversee the building of a new plant for shale oil exploration. 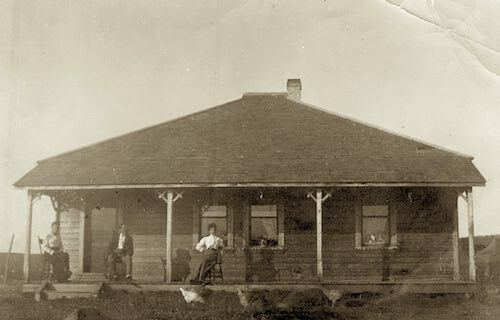 After Annie's parents had returned to Scotland, the entire family emigrated to Canada in 1903, and they took out a homestead near Dog Pound, about 30 miles north of Calgary, Alberta. Annie married my grandfather Ernest Leopold Bell (1863-1936) in 1906, and they began homesteading thirteen miles north of Cochrane near the Beaver Dam Creek. They ranched horses for sale to the North-West Mounted Police (NWMP) while raising four children: William Robert Bell, Annie Jessie Bell, Ernest Archibald Gentles Bell, and Margaret Stewart (Daisy) Bell. Like other young men, Ernie tried his hand at many things. As one of the famous Steele's Scouts, he had fought in the North West Rebellion in 1885. Though slightly under six feet tall, he was nicknamed Shorty, being the shortest of the troop and rated by some its most expert plainsman. Ernie had trekked overland to the Klondike gold fields in 1898, taking the arduous Edmonton route. The best claims had already been staked before he arrived at Dawson City, but he did manage to pan a few gold nuggets. When he wed Annie, Ernie had a Calgary jeweler craft their wedding rings by combining his Klondike gold with Indian gold from a ring that Annie's parents had given to her. 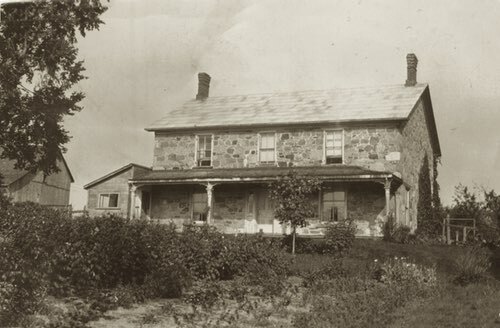 The spacious two-storey house had been built of fieldstone by Thomas Sedgwick in the 1830s at a cost of $300, including $80 for the stonework. After Grandpa Ernie had died in 1936, Grannie Bell lived in one half of our stone house while my parents lived in the other. 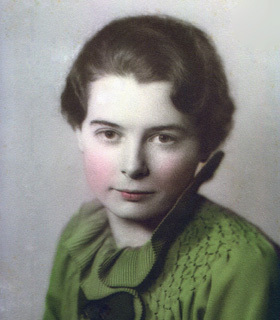 So, I came to know her well when I was a youngster in the early 1950s. Grannie was Scottish through and through, and an excellent cook. Sitting in her kitchen and watching her bake pies, cookies, and scones comprise some of my fondest childhood memories. She would take a golden scone warm from the oven, carefully split it with a table knife, then dab a wee bit of butter and her homemade orange marmalade on it. I can still remember the marvelous taste. And the taste of her oatmeal cookies was simply to die for! Grannie cooked mostly from memory so not many of her written recipes survived. However, several are featured on this site and for that we are grateful. (1) Big Hill Country (Cochrane and Area Historical Society, 1977), 476. I now had the resources, all those wonderful dessert recipes, but I also had a problem. How would I go about sharing them with recipe lovers? I needed to find a simple solution that would be both profitable and fun to do. Eventually, an idea formed. I could publish some of the recipes on a website and compile the rest into a series of cookbooks (Ebooks) that people could purchase and instantly download. However, I knew nothing about building a website, and I would need to learn how to start an online business. Anyone surfing the Internet soon discovers that there are tons of hosting companies and website building tools online, and some are even free — you've likely seen their flashy ads on television. They all make it seem so easy! However, what they don't tell you is that online businesses have a high failure rate. That's because once you've built the free website, you're left high and dry on your own with few instructions and little hope of attracting visitor traffic. No matter how beautiful the website is, it isn't a business! I decided I did not want to waste my time and hard-earned money on a venture doomed to failure. Nor did I want to pay someone thousands of dollars to build a site for me that I would have no control over later. I simply wanted to get online and share Grandma's recipes! One day while searching on Google, I stumbled upon the perfect solution to my problem — a company called SiteSell and its unique opportunity called Solo Build It (SBI!). It's altogether different from anything else being offered. 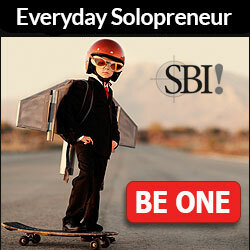 It's a simple, all-in-one package that shows you how to start an online business. SBI! takes Internet novices by the hand and helps them turn almost any interest, skill, or hobby into a successful website and online business. And you'll be encouraged to know that many SBIers (that's what people using Solo Build It call themselves) are making really good income with their sites. I have to admit that I was skeptical, but I took the plunge and started this website in May 2004, and the rest as they say, is history. Just look at my site now! Solo Build It was quite simply the answer to my prayers, and I shudder to think what I would have done without it. I just wanted to say I've been fan of this website for quite some time and am so glad you began this site. I too remember the desert table at family functions, and the special deserts my aunts would bring to festivities. Operating this site is a labor of pure joy. It provides me with an interesting, creative outlet, and a wonderful hobby. And it has fulfilled my desire to earn some extra cash while working at home, giving us the freedom to do whatever we want in our retirement. There's also the rewarding experience of seeing our family's dessert recipes being read by millions of visitors from dozens of countries around the world. Can you imagine what a thrill that is? And the visitor response has been amazing! Fans and foodies love the old fashioned recipes, and their genuine words of appreciation mean so much. Mom and my grandmothers would be thrilled and proud, and I can't thank you enough for visiting my website and helping to make it all possible. If starting a recipe site or a website based on your favorite topic interests you, be sure to read my Solo Build It Review for step-by-step information on how to begin. I'm looking forward to sharing all I've learned with you. P.S. —If you click the following link to SBI! and subscribe, you can start your own website today, and though I stand to earn a small commission, it does not cost you any extra. This is called being an "affiliate." That said, Solo Build It is a product that I use and love, and I know you will love it too.